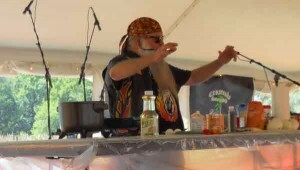 Recently I presented my cooking show at The Crossroads Rally in Waterbury, Vermont. The event is held in a large field in the middle of gorgeous mountains. Even though it is in the mountains, that field is actually a flood plain, so nothing can be built there. If this sounds confusing, let me explain, there is a river next to the field and this is all in a valley. Heavy rain or rapidly melting snow or both together overflows the river. While it guarantees the site won’t become condos or a shopping plaza next year, it also prevents installing event support buildings. Part of the behind the scenes stuff that a cooking show requires is refrigeration and sanitary cleanup facilities. Often when working out in a field like this we have to use coolers and transport the equipment to a remote kitchen for clean up. 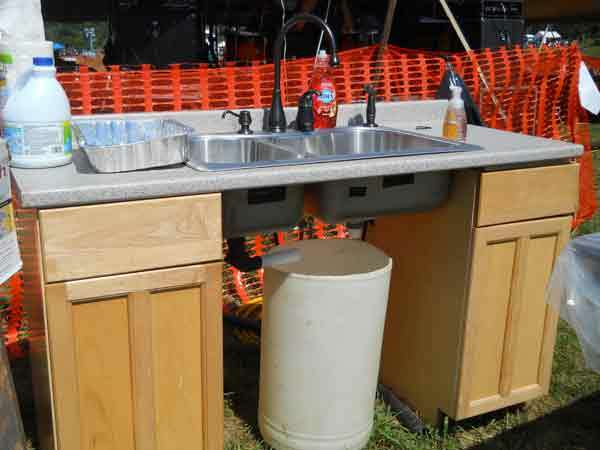 Hand washing can be accomplished with something as simple as one of those 2.5-gallon water jugs from any supermarket, but equipment cleaning needs sinks. Three to be precise: wash, rinse and sanitizer; so what do you do? 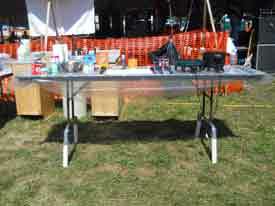 Yankee ingenuity to the rescue; one of the rally volunteers Jim Bransfield had us covered. Like a magician pulls a rabbit out of his hat, out of his truck he pulled everything we needed. While I unpacked my gear I watched as he assembled a double stainless steel sink along with supporting countertop and cabinets. He then proceeded to plumb it into a long run of hose to a not so nearby well. 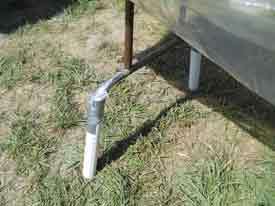 Following that up with a drain setup and catch bucket for the grey water that handled two shows of clean up. In true biker style problem solving the main run of black hose used the sun’s heat to make continuous warm water. That beats Solyndra for solar power and was hundreds of millions cheaper too! To finish it all off he the used extra PVC pipe to adjust the low rental table up to a perfect height for me to stand and cook. This seemingly small thing makes a huge difference in the show and for my back. 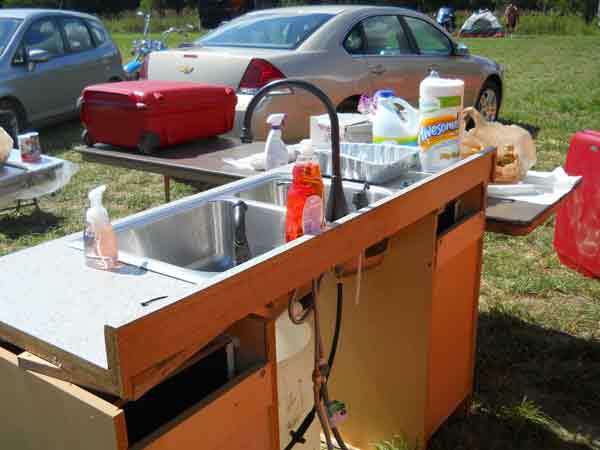 Thank you Jim for hooking me up with everything including the kitchen sink!